It’s shaping up to be an exciting summer at the theaters for anime fans. This week brings the second “Attack on Titan” animated feature, and in July we’ll be seeing the latest project from “Summer Wars” director Mamoru Hosoda. In August, though, the big anime event is the premiere of “Boruto –Naruto the Movie-,” featuring the newest generation of ninjas in manga creator Masashi Kishimoto’s “Naruto” franchise. But many kids fight with their parents while growing up, and it doesn’t look like “shinobi” families are any exception, as the film’s first full trailer shows that new protagonist Boruto doesn’t exactly get along with his famous father. Toho showed off a short teaser for “Boruto” back in April, but this week the distributor has released a regular trailer for the film. 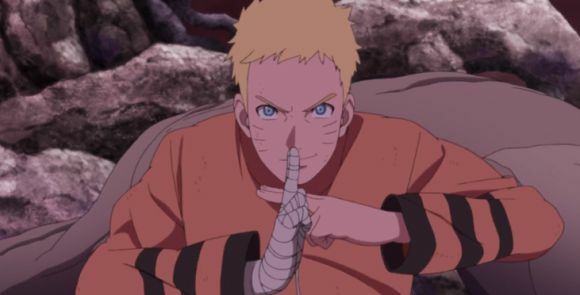 Thanks to Bolt’s few snippets of coarse dialogue in the teaser, we already had a hunch that he might not hold Naruto in the same lofty regard as the ramen-loving ninja master’s legions of adoring fans, but the preview shows their relationship is even more strained than we’d imagined. But while Sarada is gunning for Naruto’s job, Boruto is turning to Sasuke for help. The trailer shows him begging the older shinobi to make him his disciple so that he can become strong enough to defeat his father. Sasuke agrees to the request, though he doesn’t seem to harbor anywhere near the anger and resentment against Naruto that the Hokage’s own son has for him. On the contrary, he chides Boruto for being less capable and intelligent than his father, even while taking him under his wing. Good-natured Naruto doesn’t look to be turning his back on Boruto, either, given some of the tender scenes the two seem to share. Don’t worry, though, it looks like it’s not just parenting techniques that Naruto will get to show off, but his ninja ones as well, as the trailer also makes references to a crises threatening the village. “Boruto – Naruto the Move-” opens in theaters across Japan on August 7.